Wise 8WD588 Series Logo Mid Back Boat Seat Features Aluminum Hinges and Embossed Vinyl Pattern. Plastic Injection Molded Seat Frame. Marine Grade UV and Mildew Treated Vinyl. Marine Grade High Compresson Foam Padding. Comes with Mounting Hardware to Mount to any Standard BIA 4 Bolt Pedestal System. 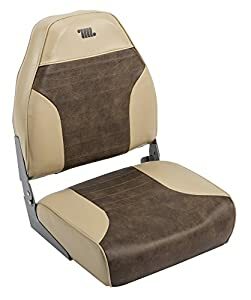 Seat Dimensions – Height: 21.25″, Width: 17″, Depth: 21″, Seat Depth: 14″. 6 Year Warranty on Frame, 3 Year Warranty on Upholstery.